Chisom Anekwe,the mother of two beautiful daughters died in Magodo Specialist Hospital in Lagos while giving birth to her first son.The death of young woman,Chisom Anekwe was in April,2017,but today,the call for every woman,mother,husband and father and all who has and belong to a family is to seek justice for late Mrs.Chisom Anekwe, thus,we now have such code as ''Let's help save our wome'',justiceforchisom'',and all that,so that what happened to her,will not be another woman's experience during childbirth. What apart from Doctor's negligence was the exact reason why Chisom died while giving birth? Let's find out! This was told by Ahmed Alaga, a member of LEAP Africa. I just love what Ahmed Alaga said ''we can't help but to push out the story of how she died so individuals, families, and our society at large will perhaps take nothing for granted when it comes to women giving birth''. Yes,what killed Chisom Anekwe is not anything birth pains,but negligence. 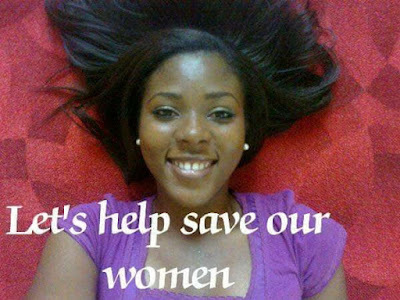 Negligence of the Doctors,negligence of Chisom's husband and negligence from the part of Chisom herself. If you say that we said so,then you lie. We didn't. The story surrounding the death of Chisom's death has it that this poor woman had been in labor for four days,and the Doctors and Chisom's husband didn't seem to do anything about it. A wise man being a husband on seeing that the hospital is weak at handling serious matters,would not take any chances at all. What would such a man be doing in day one day, two and even in day three while his beloved wife was seriously groaning in pains? Just praying and asking God to send help from above when he should have transferred his wife to another hospital for safe delivery? Yes,Chison Anekwe is dead and everyone is now talking about it. As an experienced woman and mother of two,she must have noticed that the situation at this point of child delivery was quite a very different one,and yet,she kept mute while wallowing in pains. This was made clear to us by one of her family members and friends,who said '' Chisom was abandoned and left unattended to deal with labour pains and other pregnancy complications.'' Of course we have heard of how Doctors and Nurses neglect their patients at critical hours over time,and how the wise ones among the neglected patients would ask to be transferred to another hospital. If only Chisom and her husband had taken this same action,Chisom Anekwe,may not have died!! !